And when Abram was ninety years old and nine, the LORD appeared to Abram, and said unto him, I am the Almighty God; walk before me, and be thou perfect. And I will make my covenant between me and thee, and will multiply thee exceedingly. And Abram fell on his face: and God talked with him, saying, As for me, behold, my covenant is with thee, and thou shalt be a father of many nations. Neither shall thy name any more be called Abram, but thy name shall be Abraham; for a father of many nations have I made thee. And I will make thee exceeding fruitful, and I will make nations of thee, and kings shall come out of thee. And I will establish my covenant between me and thee and thy seed after thee in their generations for an everlasting covenant, to be a God unto thee, and to thy seed after thee. And God said unto Abraham, Thou shalt keep my covenant therefore, thou, and thy seed after thee in their generations. This is my covenant, which ye shall keep, between me and you and thy seed after thee; Every man child among you shall be circumcised. And ye shall circumcise the flesh of your foreskin; and it shall be a token of the covenant betwixt me and you. And he that is eight days old shall be circumcised among you, every man child in your generations, he that is born in the house, or bought with money of any stranger, which is not of thy seed. And the uncircumcised man child whose flesh of his foreskin is not circumcised, that soul shall be cut off from his people; he hath broken my covenant. Beware lest any man spoil you through philosophy and vain deceit, after the tradition of men, after the rudiments of the world, and not after Christ. For in him dwelleth all the fulness of the Godhead bodily. And ye are complete in him, which is the head of all principality and power: In whom also ye are circumcised with the circumcision made without hands, in putting off the body of the sins of the flesh by the circumcision of Christ: Buried with him in baptism, wherein also ye are risen with him through the faith of the operation of God, who hath raised him from the dead. And the shepherds returned, glorifying and praising God for all the things that they had heard and seen, as it was told unto them. And when eight days were accomplished for the circumcising of the child, his name was called JESUS, which was so named of the angel before he was conceived in the womb. And the child grew, and waxed strong in spirit, filled with wisdom: and the grace of God was upon him. Now his parents went to Jerusalem every year at the feast of the passover. And when he was twelve years old, they went up to Jerusalem after the custom of the feast. And when they had fulfilled the days, as they returned, the child Jesus tarried behind in Jerusalem; and Joseph and his mother knew not of it. But they, supposing him to have been in the company, went a day's journey; and they sought him among their kinsfolk and acquaintance. And when they found him not, they turned back again to Jerusalem, seeking him. And it came to pass, that after three days they found him in the temple, sitting in the midst of the doctors, both hearing them, and asking them questions. And all that heard him were astonished at his understanding and answers. And when they saw him, they were amazed: and his mother said unto him, Son, why hast thou thus dealt with us? behold, thy father and I have sought thee sorrowing. And he said unto them, How is it that ye sought me? wist ye not that I must be about my Father's business? And they understood not the saying which he spake unto them. And he went down with them, and came to Nazareth, and was subject unto them: but his mother kept all these sayings in her heart. And Jesus increased in wisdom and stature, and in favour with God and man. Submit yourselves therefore to God. Resist the devil, and he will flee from you. Draw nigh to God, and he will draw nigh to you. Cleanse your hands, ye sinners; and purify your hearts, ye double minded. Be afflicted, and mourn, and weep: let your laughter be turned to mourning, and your joy to heaviness. Humble yourselves in the sight of the Lord, and he shall lift you up. Speak not evil one of another, brethren. He that speaketh evil of his brother, and judgeth his brother, speaketh evil of the law, and judgeth the law: but if thou judge the law, thou art not a doer of the law, but a judge. There is one lawgiver, who is able to save and to destroy: who art thou that judgest another? Go to now, ye that say, To day or to morrow we will go into such a city, and continue there a year, and buy and sell, and get gain: Whereas ye know not what shall be on the morrow. For what is your life? It is even a vapour, that appeareth for a little time, and then vanisheth away. For that ye ought to say, If the Lord will, we shall live, and do this, or that. But now ye rejoice in your boastings: all such rejoicing is evil. Therefore to him that knoweth to do good, and doeth it not, to him it is sin. Go to now, ye rich men, weep and howl for your miseries that shall come upon you. Your riches are corrupted, and your garments are motheaten. Your gold and silver is cankered; and the rust of them shall be a witness against you, and shall eat your flesh as it were fire. Ye have heaped treasure together for the last days. Behold, the hire of the labourers who have reaped down your fields, which is of you kept back by fraud, crieth: and the cries of them which have reaped are entered into the ears of the Lord of sabaoth. Ye have lived in pleasure on the earth, and been wanton; ye have nourished your hearts, as in a day of slaughter. Ye have condemned and killed the just; and he doth not resist you. Be patient therefore, brethren, unto the coming of the Lord. Behold, the husbandman waiteth for the precious fruit of the earth, and hath long patience for it, until he receive the early and latter rain. Be ye also patient; stablish your hearts: for the coming of the Lord draweth nigh. Grudge not one against another, brethren, lest ye be condemned: behold, the judge standeth before the door. Thou Who art by nature God, didst without change take human form,/ O most compassionate Lord,/ and in fulfilling the Law of Thine own will didst receive circumcision in the flesh,/ to banish hades and roll away the veil of our passions./ Glory to Thy goodness; glory to Thy compassion;/ glory to Thy condescension, O Word. Thou Who sittest with the Father/ on a fiery throne in the heights/ wast pleased to be born of a Virgin through the Divine Spirit on earth./ Wherefore Thou wast circumcised as a man on the eighth day./ Glory to Thine all-gracious will; glory to Thy providence;/ glory to Thy condescension, O only Lover of mankind. Thy fame has gone forth into all the earth,/ which has received thy word./ Thereby thou hast taught the Faith; thou hast revealed the nature of created things;/ thou hast made a royal priesthood of the ordered life of men./ Righteous Father Basil, intercede with Christ our God/ that our souls may be saved. 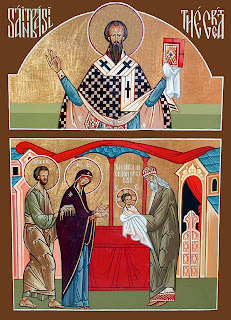 In undergoing clrcumcision/ the Lord of all has circumcised the sins of mortal men./ On this day He gives salvation to the world./ And the Hierarch Basil, the Creator's lightbearer/ and Christ's mystic, rejoices in the highest. Thou wast an unshaken foundation of the Church/ and didst give to all mortals an inviolate lordship/ which thou didst seal with thy doctrine,/ O righteous Basil, / revealer of the mysteries of heaven.